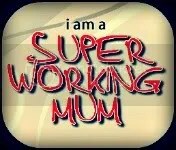 9 months and Being a Working Mum | Call Me Mummy!! Anjie is definitely becoming more independent but we’re also going through the separation anxiety stage. When I’m not there she’s fine, but once I’m back home she pretty much sticks to me like glue! This is lovely and all but most times I need to get stuff done around the house. It’s getting better though, I guess it helps that my mother in law looks after her while I’m at work and she’s just adjusting to my being back at work. Talking about being back at work, one thing I miss is cooking. Don’t get me wrong I don’t love cooking but I do love to experiment with food. But sadly these days when I get home I just want to eat, relax and spend time with my family. So I’ve decided to go for the easier option! Freezing food! Of course there nothing better than fresh veggies or stews but a girl has gotta do what she’s gotta do! I now save all the heavy cooking and experimenting for weekends and I don’t hesitate to take the lazy man’s way out by buying already made sauces (curries especially) and spicing it up a little. I’m also learning to create weekly food plans but so far we’re still struggling. This is down mainly to my easily getting bored with food but we will get there :). I’ve finally deactivated my Angelcare sensory mat. I must admit I was a little worried as she still sleeps on her tummy but I’ve been told its fine from around 6-7months. I definitely felt like something was amiss but I got over it eventually. Now the monitor is set to cone on when she makes noise, it doesn’t monitor her movement and breathing any more. I decided to switch it off as she can be quite restless some nights and ends up at one end of the cot or the other which then sets off the alarm… In the middle of the night… After waking up 2-3 times at night looking for food… Go figure. This month Anjie has finally started standing for a few seconds before she falls or drops down – so I guess walking is not far off, once she gets more confident. She also understands a few things like no and come here; she a pro at clapping too but waving, we’re still getting there. She still bites when breastfeeding but not as bad so hopefully she gets the message – you bite and there goes your food! We’ve also got the third tooth coming through so that might explain the biting! Can’t wait for teething to be over! ← Let the biting begin! And what else? What a cutie! Look at all that hair!! 🙂 Oh, you are in for it soon with her already standing, LOL! My little boy would prefer to be attached to me most of the time too. Little stinker-he makes it near impossible to get everything done! 😛 Glad things are going well. You’ll get there with the meal planning!